The Kite in Sekiro Senpou Temple is a puzzle for you to solve, and people have been wondering about what to do with the Senpou Temple Kite. The trick is to keep the string extended. To solve the Senpou Temple Kite Puzzle in Sekiro, you’ll have to obtain a specific item, that doesn’t come until later in the game. And even then, you will have to follow some ludicrous steps in order to get what you need. So, here’s our Sekiro What to Do With Kite in The Senpou Temple guide to show you exactly how to solve the Kite puzzle. Strap in. How to Stop Kite in Sekiro Senpou Temple? To stop the kite in Sekiro Senpou Temple, you’ll first have to get a special weapon. This is your reward for a lengthy quest chain that you only get after slaying Genichiro. So, if you haven’t yet killed him, I’d suggest bookmarking this page and coming back after you do, because we’ll be getting into some SPOILERS from this point on. All set? Good. The weapon that you’ll need to complete the Sekiro Kite Puzzle is the Mortal Blade. 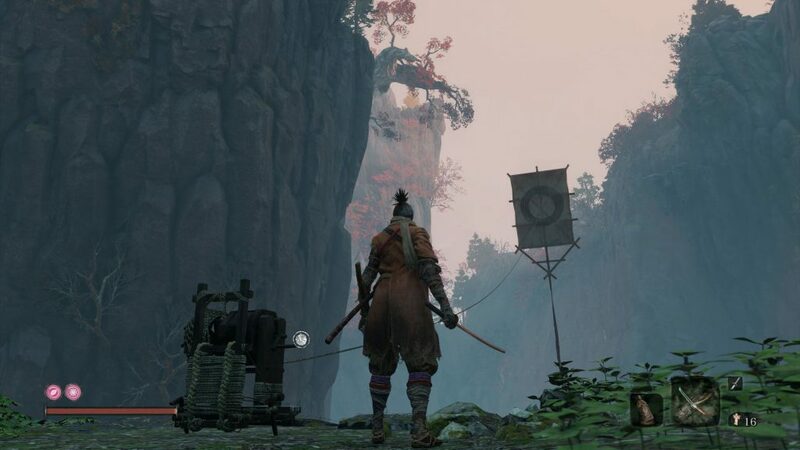 You can find the exact instructions on how to get that in our Sekiro Mortal Blade Location – How to Get guide. Here, we’ll present you with a quick TL;DR.
Basically, after you kill Genichiro, you can then speak to Kuro The Divine Heir, then Emma, then Isshin Ashina, until you get to talk to him about the Mortal Blade. Then, you have to go back to the Main Hall Idol in the Senpou Temple area. On the desk with the golden flowers, there should now be a bell that you can ring, which will transport you into another area. There, you’ll have a puzzle-like battle against four monkeys. Upon defeating the monkeys, you’ll get to talk with the NPC Divine Child of Rejuvenation, who will then give you the sword. By the way, this is also how you get Rice for the old lady. Sekiro Kite Puzzle – How to Solve? After you finally manage to reach the Inner Sanctum, you’ll note that you’ve gotten a new Ninjitsu ability that allows you to create puppets from enemies. Make sure to equip it. Then, travel back to the Kite. Sneak behind the Rat there, execute a Death Blow, then hit R1 quickly to turn him into your servant. He’ll then proceed to the crank and extend the Kite. He’s going to stay there even after you die, so don’t worry about him anymore. Now, make your way to the Shugendo sculptor idol. Climb up the ledge next to it, and walk onto the branch jutting over the cliff. Grapple over to the other side, then up onto the roof of the building in front of you. Get to the top of the roof, then grapple over to the large tree, and once again to the top. Walk over onto the left bough, and look above you. That’s where you’ll spot the kite, so all that you have to do now is use the grappling hook to get to the other side. Your reward for pulling all of this off is the chance to get even with the giant snake, once and for all. You’ll have to do some platforming across the boughs sticking out from the cliff. This will also grant you a powerful item, but that’s a story for another time. Horrible description as to where to go. You need to work on your directions, bud.